Steve: Welcome to the Becoming Your Best podcast wherever you might be in the world today. This is Steve Shallenberger your host and we are so grateful for your feedback, comments, and suggestions regarding the show. It’s been amazing. You are an extraordinary group and we are grateful for the privilege to be counted among you. 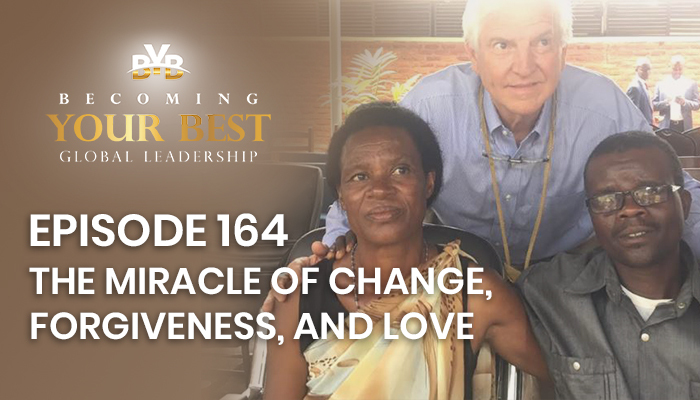 Now today’s subject for this show is the miracle of change, forgiveness, and love. And it’s really inspired by an experience that my wife Roxanne and I had about seven months ago in the country of Rwanda in East Africa. In April of 1994 almost twenty five years ago they suffered a terrible national tragedy as one of the political parties or tribes plotted and set a plan to exterminate another tribe a very large population in their country who saw things differently. They amassed secretly over a hundred thousand machetes and then in April of 1994 the slaughter commenced. It was terrible. In 100 days one point one million of their fellow countrymen were killed. This is by neighbors and fellow workers. It was terrible. A army outside of the country was raised by a fellow by the name of Paul Kagame. It was called the Patriotic Front and they came in and stopped this terrible slaughter. And by the time that it was done he really thought he eventually became the president, how can I ever get this country back on track. He set a bold vision. It was called Vision 2020 where they would have a strong safe country an educated middle class. It was a strong middle class and it would be a progressive country where there was hope. He said we can’t do it as Hutus or Tutsis. He said we’re going to do it as Rwandans together. This inspired vision really helped change a country. Today, many years later it’s now the second fastest growing economy in all of Africa. It’s the fifth safest country in all of the world. You can go anywhere 24/7 and not worry about your safety it’s an extraordinary place. I mean it’s upbeat and it’s positive and indeed the middle class will have doubled their income. They still certainly have a long ways to go. But my goodness have they made enormous progress. Part of this ability to get this country back on track was a program called reconciliation and I’ll talk about reconciliation in just a moment. When we were there seven months ago it was a part of a group from the Young President’s Organization. There were about 70 of us a wonderful group and we visited the Genocide Memorial. Now I’ve had the opportunity to be there before. It’s about a half an acre of land give or take some. But on that land there are two hundred and fifty thousand victims from the genocide buried there. It is a memorial as you go inside there’s pictures of the babies and the young kids and the mothers and their older people it cut across all swaths that were murdered. It’s a sobering experience. Across the way from the genocide memorial is a pavilion. It’s about 300 feet away and it’s called Reconciliation Village. We had the opportunity to visit there and on this particular day it had been arranged for the members, 35 members, of a village to come in and share their experience of what had happened during that time. In front of us stood a lovely lady. Her name was Maria. She is tall and slender and talked about her family. She had nine children and then she related that when this genocide began, perpetrators the ones who committed these terrible crimes came into her village as she was escaping six of her children were killed right then. Three of her children together with her were able to escape in the forest. But she had suffered the terrible loss of most of her family. Oh my goodness we were speechless and she sat down and then the fellow next to her stood up. His name was Patrick. Patrick then said I am the one that killed her children. We tried to take this in and then he related his part of the story that he was 18 years old part of the Hutu tribe just doing what they told him to do. He indicated they taught him and so many others of his age that the Tutsis were a threat to their future that they were subhuman and that they didn’t deserve to live and they put everybody at risk. They also mentioned that they’re like snakes and how can you tell a snake where you can look into the eyes of a snake and the best way to kill a snake is to cut its head off. So they dehumanized them. It was a terrible plan. And then he said when Paul Kagame, the General came into town with the Patriotic Front, he said we were put in prison. There, I stayed in prison and soon became aware of the horrible atrocities, of how wrong it was what I had done. He said I just didn’t understand it before. And Paul Kagame, together with the other leaders who had come in introduced this policy of reconciliation and the policy of reconciliation is the perpetrator would go to the victim the living victim and say I killed your family members and here’s where they’re buried. And it was the responsibility then of the victim to forgive them. And so he said after five years I was totally repentant and I was let out of prison to go back to this village and to find the people whose families I had killed and apologize. He said I went up to Maria and I said I’m the one that killed your six children and I am so so sorry. Maria looked back and said I forgive you. Well this was a very somber time. We all tried to take this in and what it meant and then we realized the enormous power of repentance, of change, of the hope that that could give someone, but also the enormous power of forgiveness and that it took great love and compassion to be able to do this. Now today Patrick is a friend with Maria. He actually goes by and does service at her home. He lives in that village and he helps many, many people. And so they moved on. They have a hope for life. I had a, the next day, driver’s name was John Paul. We are going up to the north in the country. John was about 34 years old and I asked John I said so how are you affected by the genocide did that impact you at all. He related that one day during this time in 1994 about in April he said the perpetrators came into their village and they ushered 4000 people from their community into a large Catholic Church. They bolted the door shut and then they started throwing in grenades. John Paul related that that day there were only eleven survivors all of the rest were killed including his parents and three brothers and sisters. I asked him I said how in the world have you been able to move forward. How have you been able to adapt and he said because I was able to forgive them. And so this is a tremendous force that frees people up that it just gives them a perspective of life. John Paul said listen I’m making the most of my life. He said I live it vicariously for my family because I’m here, because I can. This is the liberation that comes, the hope of the future that comes from being able to change the repentance to make things right to forgive, and this comes through the power of love. So as I went forward and thought about this if these people can do this over such grave crimes certainly we can all do it over setbacks and injustices that take place in our lives, misunderstandings. We can be bigger than that situation. I’d like to just share two other true stories that illustrate this miracle of change, forgiveness, and love. One comes from a talk by Thomas Monson the former president of the Church of Jesus Christ of Latter day Saints and whom I had was fortunate to have as one of my mentors. He’s been so influential in my life. He’s now passed on. But what a legacy he left behind. Among the talks that he gave he entitled it Hidden Wedges from which he shared the story from Samuel T Whitman. Whitman who related the following. shared this story that one of his inspired mentors named John shared with him. very infection that the doctor had been treating at another home that night. wrong. He had lost his wife. He had no way to tend both the baby and his work. little girl said simply daddy wants you to come over. He wants to talk to you. this shepherd had been watching his flocks and had something to say to John. in tears and she pleaded and said to me I’m trying as hard as I can. Oh man. you and I hope that you can hear it okay. Steve Shallenberger your host with Becoming Your Best, wishing you a great day.